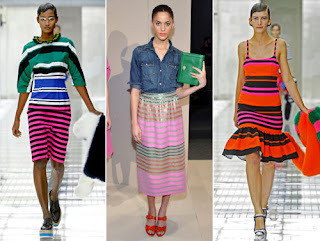 While I have a serious problem with the idea of buying spring collections in early December (I used to think that having them in February was too early. I guess not), one can't ignore that they are, indeed, trickling into stores as we speak. It's more than a little overwhelming. You can see the new Chanel Spring 2012 makeup collection on Best Things In Beauty, and especially the lovely Horizon de Chanel blush. Horizontal stripes have been an ongoing trend, not always in the best interest of the wearers. But last month I attended a press event for Muse Apparel, where the dresses that caught my eye were actually these striped ones. 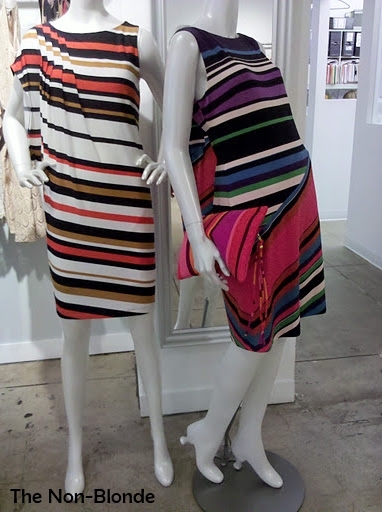 The one-shoulder dress with its tilted stripes is especially clever and flattering. I really wish they were made of silk and not polyester, but then again, Muse is a very affordable line (all the dresses are priced between $138-158, museapparel.com and in Lord & Taylor stores). The dresses are well-cut, something I truly appreciate. 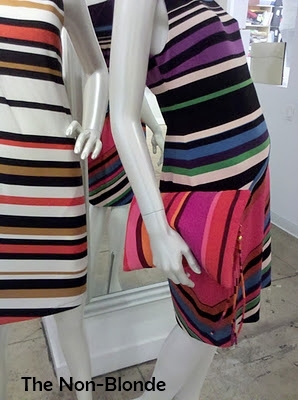 For those still scared of stripes all over their body, the cute clutch might hit the spot.